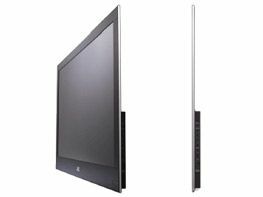 JVC has announced that it will be shipping the world's slimmest 32-inch LCD panel in Japan this August. The set is a Full HD LCD using JVC's new 36-bit Genessa Picture Engine that can reproduce 100 per cent of the sRGB colour space and 90 per cent of Adobe RGB (with special display modes for digital SLR cameras). As it's also the lightest production 32-in set (just 5.7kg), it's easier on the environment, too, using around half the materials than a typical (10kg-ish) television, and JVC claims that it also uses less mercury in the construction of its LED backlight. Viewing angle figures seem impressive (178 degrees both horizontally and vertically) but brightness and especially contrast ratio (a mere 4000:1) suffer compared to chunkier TVs. Similarly, there are just two HDMI ports and you'll need to buy an optional speaker system (2 x 5W) to get any sound out of the GD-32X1. JVC will be making just 10,000 unts of the GD-32X1 available for sale, late in August, and there's no price as yet.